A court in rural China sentenced a gravel hauler to life in prison for avoiding some $550,000 in tolls. 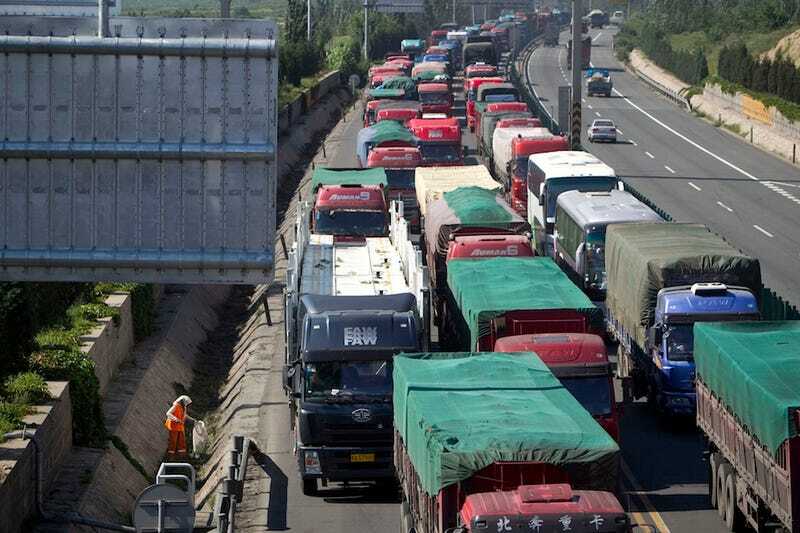 Now his conviction has set off an uproar among Chinese citizens tired of a neverending maze of road fees. Shi Jianfeng, a farmer from Henan Province who'd turned to hauling rocks for a living, used fake plates on his two trucks to dodge tolls on 2,300 trips. The court that ordered Shi to prison for life also assessed a $300,000 fine, suggesting he hadn't contested the charges. But with much of China's busting road construction paid for with higher tolls, residents say the system has grown abusive, with government officials boosting toll booths while allowing cronies to avoid them and pocketing the fees themselves. In some areas tolls reach $1 per kilometer; and online commenters noted that Shi only made $30,000 while avoiding the tolls. As one Chinese newspaper says, the ever-growing toll burdens make drivers "feel like a piece of meat on a cutting board." If only there were a way for people to express their governing preferences in a free and open fashion.